Stated succinctly, one of the best books on family and personal finance I have read—and I have read many. The unique approach to labor and asset accumulation sets the foundation for an enjoyable and relevant reading from start to finish. Family Inc. is not a ‘how to’ book – it is a ‘how to think’ book that empowers the reader to take control of their family’s finances. McCormick presents sophisticated financial principles and concepts in an accessible way, and teaches the reader how to tailor and apply them to their situation to achieve their financial and life goals. If you want one good book to read, re-read, and keep as a long-term financial reference, Family Inc. is the book for you. Mission accomplished! This easy-to-read masterpiece provides a well- organized framework and process to review personal/family finances. Doug uses the disciplined approach of a successful business to explain key financial and life goal concepts, which will allow you and your family to confidently chart your own course to financial independence. Family Inc. provides a unique framework to managing your family’s finances that helps the reader derive practical solutions tailored to his own needs for life’s most important financial decisions. For those facing the full gamut of personal finance challenges—educational, career, retirement, or savings—it’s a must read. McCormick makes a compelling case that at some level we are all entrepreneurs—selling our labor and skills like any business owner. Most importantly, Family Inc. provides actionable advice on how to maximize the value of your labor through education, career choice, and skill development while combining it with your capital to achieve financial independence. Financial illiteracy is not only an individual problem; it is a threat to our national welfare and global competitiveness. In today’s word, it’s more important than ever for individuals and families to understand how to create financial independence and security. Family Inc. offers a new perspective on personal financial security, applying time tested business principles to real-world family situations. By taking a different perspective--seeing a family's full financial situation the way an experienced private equity investor would--McCormick shows us how to appreciate the full range of our choices and opportunities as a family 'CFO'. 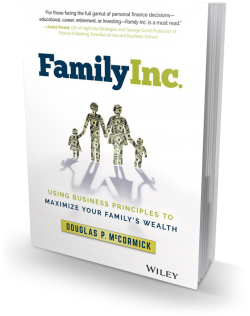 Family Inc. is an easy read which offers a solid blue print for making sound financial decisions. Family Inc. provides a fresh perspective for the important financial decisions that families face at each stage of their lives. I particularly like the chapters on career choices and on family budgeting. Readers will learn how to approach personal budgeting and investment decisions as dispassionately as any business would. Personal finance books have always had a problem. The people who know what they are talking about can't write. And the people who can write are often charlatans. Not any longer. Family Inc delivers something that families across the country desperately need: a clear, accessible guide to making financial decisions based on the best available data and research. No gimmicks, no get-rich schemes--just sensible and intellectually honest guidance for making good financial decisions at every stage of life. Doug McCormick has accumulated a lifetime of experiences that have contributed to writing Family Inc. 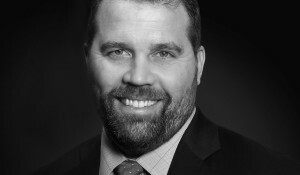 He has been a professional investor managing money for institutional clients such as insurance companies, pension funds and high net worth families for almost two decades. And he has been investing personally since his Dad helped him purchase AT&T stock at age seven. Register here to join Family Inc. and get access to free calculators and tools to develop your personal income statement, balance sheet and lifetime labor values. Learn how to apply the lessons of Family Inc. to your personal financial statements. Register Now Not now, thanks.